A movie about an all-male amateur synchronised swimming team sounds like it would feel right at home in the late 90s or early 2000s, not too long after the success of The Full Monty, which is highly appropriate considering how Swimming With Men looks and feels exactly like one of those films from that same time period, only it somehow got released in 2018 instead and features all of the obvious jokes, characterisations, and sports movie tropes that would have flown better back then, but not so much nowadays. On the one hand, the film’s anachronisms make it an amusing throwback to these kinds of generic sports movies, the ones about the underdog team made up of ragtag members who come together to achieve the impossible, but on the other hand, the writing is so slight and inoffensive that it never drifts out further than the shallow end of the pool. Either way, it’s a strange creature that’s not necessarily terrible, but not a particularly outstanding one either. The film concerns Eric (Rob Brydon), a middle-aged accountant who’s clearly bored with his life, and allows his deep fears and insecurities to let his suspicions of his councilwoman wife (Jane Horrocks) having an affair act as an excuse to essentially run away from his family responsibilities. He later finds solace in a local group of male synchronised swimmers, who hail from all walks of life as well as different ages and body sizes, who get together to practise their routine on a regular basis. When the team is approached to represent Britain in a world championship tournament in Milan, Eric begins to step up and co-ordinate his team to success, whilst also hoping to find a way to win back his estranged wife and son, who fear he’s going through some kind of bizarre mid-life crisis. It’s a simple enough premise, one where you can probably already tell all the beats it’s going to hit along the way, leading up to a climax that doesn’t take a computerised algorithm to predict, and in that regard it’s perfectly harmless. It’s also got a decent cast of character actors alongside Brydon, including Jim Carter, Adeel Akhtar, Rupert Graves, Daniel Mays, Thomas Turgoose and Charlotte Riley (the latter seemingly having the most fun as the team’s ruthless yet supportive trainer), though while they’re all fine, it’s clear which ones get the lion’s share of material to work with whilst some of the others frequently fade into the background. It even has a little bit of heart to it, as you really do sense the chemistry between these team members amidst their wildly differing personalities, and it’s nice to see them all actively working together towards a shared goal. However, all of that just adds up to something that’s just merely watchable, a movie that just kind of goes (or swims, if you’d rather) with the flow, without once stepping into deeper waters or adding any real drama to it that really kicks it up a notch. This is a perfectly harmless movie, one that you’ll easily forget about in the long term, but you’ll not regret ever seeing it either. Really, the key problem is that it just isn’t very funny. There could be plenty of opportunities for comedy regarding an all-male synchronised swimming team, especially one where virtually none of the members are necessarily in the right shape for the sport, but the movie doesn’t really take advantage of any of those opportunities and instead just goes for the stock sports movie tropes every single time, from the endless training montages to the climactic competition itself. The movie doesn’t necessarily poke fun at these clichés and tropes, rather it just is one of those movies that incorporates them into the narrative without any sense of irony to it. Outside of the fact that these clichés are the kind of things you’ve seen countless times before in any of these movies, regardless of what sport it’s focusing on, the humour that it does try and incorporate ranges from hokey sitcom schlock to just the most random sight gags – in regards to the latter, there is a turd-in-the-pool gag that literally comes out of nowhere, and it’s clearly there because the writers couldn’t think of a punchline for that scene so they just went for the lowest common denominator gross-out joke they could think of for this situation. Admittedly, there are a couple of light chuckles to be found here and there, mostly from the delivery of some cast members who do have good comedic timing, but for something that is meant to be through and through a comedy, more often than not it just doesn’t float. It is, however, an enormous step-up from director Oliver Parker’s last film, the dreadful Dad’s Army movie adaptation which was just an utter dead zone of a comedy, and the fact that this one had even just the slightest of chuckles squeezed out of me made it instantly a way funnier and more watchable movie than that one. Even then, Swimming With Men is most certainly not going to be remembered in any way shape or form in the near future, and something tells me that when it comes to putting together my end-of-year best and worst lists (incidentally, this movie is appearing on neither of those without a shadow of a doubt), I’ll probably be at a loss for a few seconds whilst I remind myself of what that movie actually was. It’s a movie that feels like it somehow ended up in a different part of the space-time continuum, and now exists in 2018 instead of 1998 or 2003 where it really belongs; that doesn’t necessarily mean it’s bad, but misplaced in the overall structure of time. 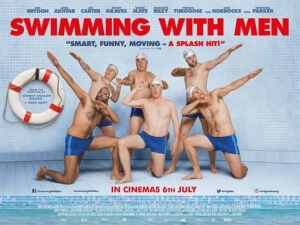 Swimming With Men is a harmless but ever so slight movie that doesn’t stray too far from the shallow end, which despite a decent cast doesn’t generate enough laughs to make it even remotely memorable in the long term.